Here in the Department of Criminal Justice at the University of Arkansas at Little Rock we take pride in our PhD students. We can truly say that we have the cream of the crop here and we are not ashamed to highlight their accomplishments. 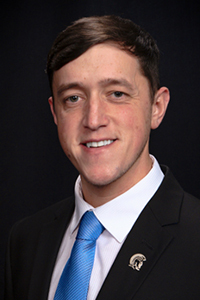 Jacob Laan, a third-year criminal justice doctoral student at the University of Arkansas at Little Rock, is this year’s recipient of the $2,500 AT&T War Memorial Scholarship. Arkansas Community Foundation will make a scholarship presentation with Laan on Sept. 12 during halftime of the University of Arkansas Razorback-Toledo Rockets game at War Memorial Stadium in Little Rock. On Friday, Sept. 11, Laan is scheduled to appear on KARK-TV’s early morning news show for a short segment with the foundation. “I know that I am only one of many student veterans at UALR and across the state of Arkansas deserving of this award, and I am humbled to be receiving it this year,” Laan said. The scholarship honors Arkansas’ 25 Congressional Medal of Honor recipients and is awarded annually to a veteran of any branch of the armed forces who is or will attend an accredited college or university in Arkansas.